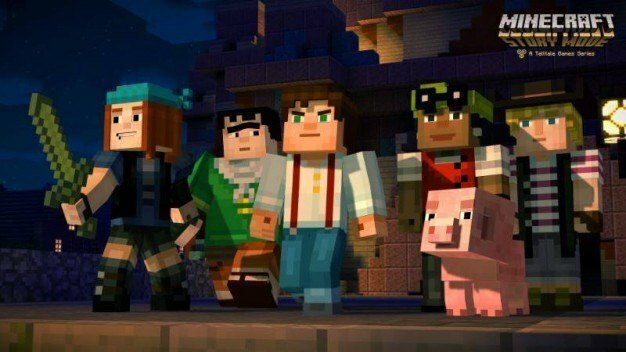 Several months ago Telltale Games and Mojang announced their partnership in developing Minecraft: Story Mode, and this past weekend the very first trailer for the upcoming game has been released. Like other Telltale games, Minecraft: Story Mode will have five parts released one at a time. It follows a group of adventurers on their journey to find the legendary ‘Order of the Stone’: the original group of adventurers who slayed the Ender Dragon. Players will control the actions of Jesse, voiced by Patton Oswalt, who leads his friends on an epic journey to save the world from its latest threat. With the trailer’s release also comes the announcement of other cast members joining Oswalt in the first season. They include Brian Posehn, Ashley Johnson, Scott Porter, Martha Plimpton, Dave Fennoy, Corey Feldman, Billy West, and Paul Reubens. This latest interpretation of the Minecraft universe promises “a story that follows the logic of Minecraft, but still manages to feel original,” according to Mojang’s Chief Word Officer Owen Hill.